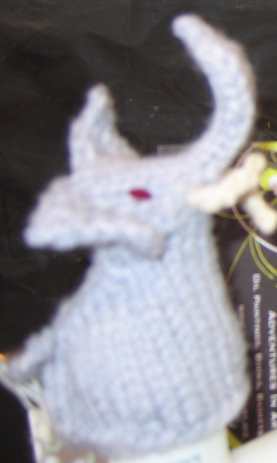 All are hand knitted of acrylic yarn with no dangerous parts to come off and be swallowed. 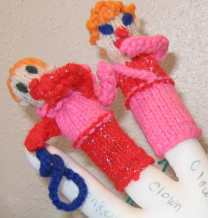 Fun puppets for children of any age! Wonderful way to talk to others. choose brown or green price is each. You can fill out the form at the bottom of this page to send me a note as to which color you would prefer. They are all fun. Great way to get kids talking together. 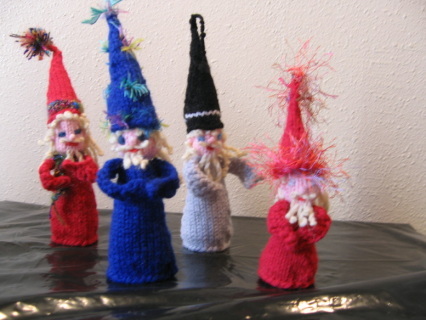 Wizards seem to be very popular and come in many colors. If you have a color preference please fill out the "comment" form at the bottom of this page just after you pay for it. Travel yarns are the original versions of classic fables printed on cards with finger puppet characters to go with the story. 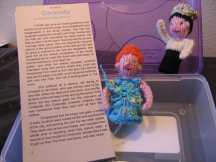 This box contains the story of Cinderella with Cinderella and the Prince finger puppets. 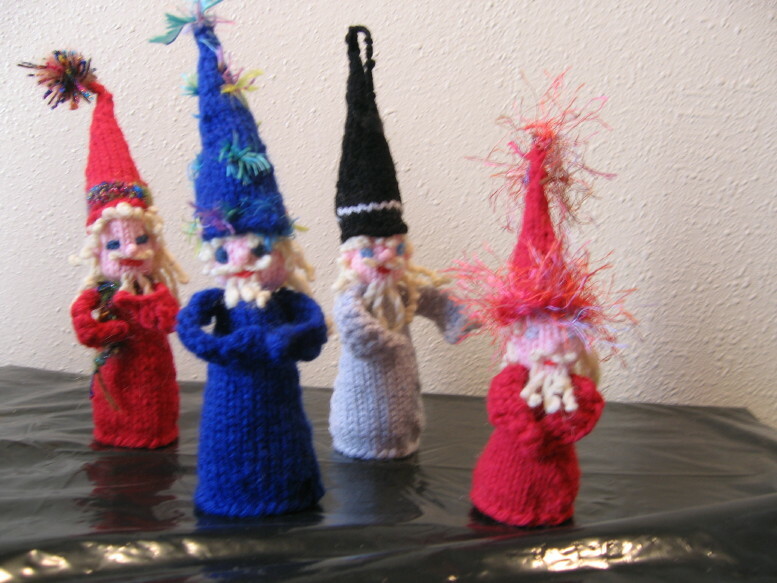 All puppets are made with yarn only and have no parts that will come off if children put them in their mouth. 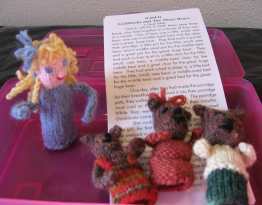 Travel yarns are the original versions of classic fables printed on cards with finger puppet characters to go with the story. This box contains the Brothers Grimm version of Little Red Riding Hood. 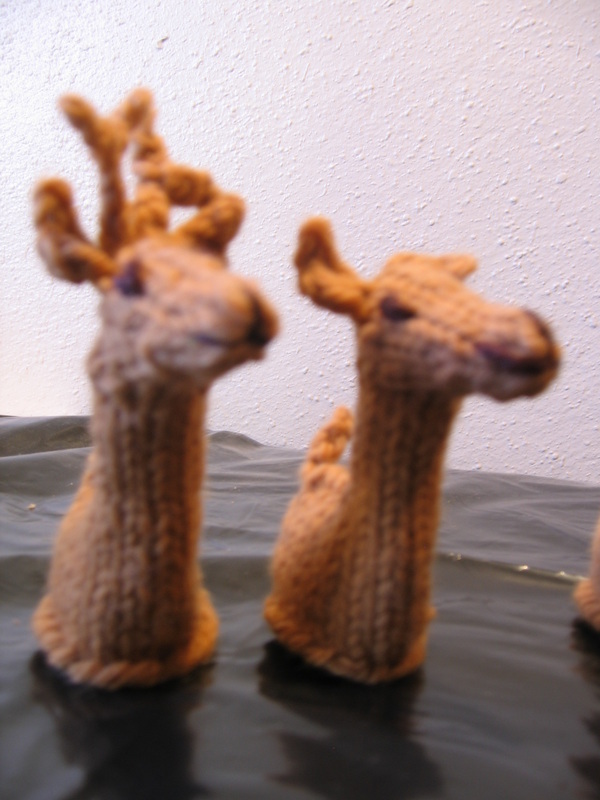 The 3 finger puppets are Red, Grandma, and the Wolf. 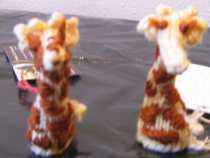 All puppets are made with yarn only and have no parts that will come off if children put them in their mouth. Travel yarns are the original versions of classic fables printed on cards with finger puppet characters to go with the story. This box contains the story of Goldie Locks and the Three bears on cards and the three finger puppets to match the story. All puppets are made with yarn only and have no parts that will come off if children put them in their mouth. Travel yarns are the original versions of classic fables printed on cards with finger puppet characters to go with the story. This box contains the storybook of The Reluctant Dragon by Kenneth Grahame of Scotland, which was written in 1854; finger puppets of the three main characters, the Dragon, Boy, and the Knight and a box to keep everything in. It is a story of friendship, the ability to compromise and help each other get what they want. 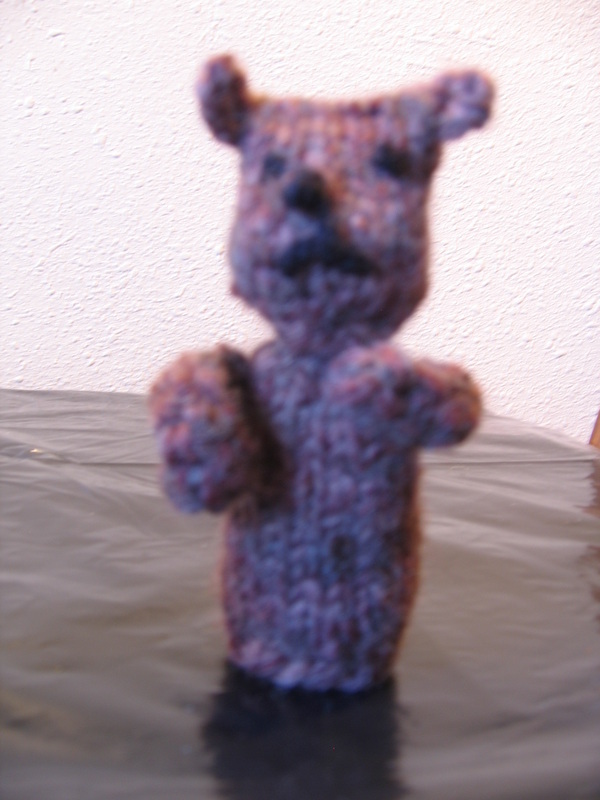 All puppets are made with yarn only and have no parts that will come off if children put them in their mouth. 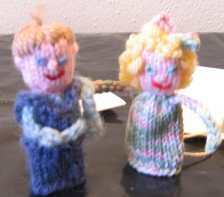 Travel yarns are the original versions of classic fables printed on cards or in a book with finger puppet characters to go with the story. 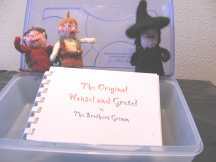 This box contains the Brothers Grimm version of Hansel and Gretel. 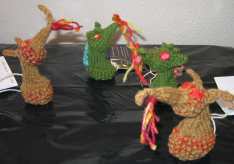 The 3 finger puppets are Hansel, Gretel, and the Witch. 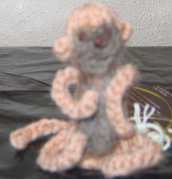 All puppets are made with yarn only and have no parts that will come off if children put them in their mouth. Travel yarns are the original versions of classic fables printed on cards with finger puppet characters to go with the story. This box contains the Olde English version of The Three Little Pigs. 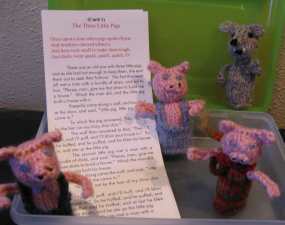 The 3 finger puppets are three pigs and 1 wolf. 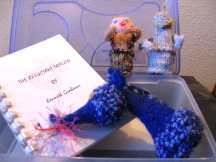 All puppets are made with yarn only and have no parts that will come off if children put them in their mouth. Questions? Comments? Custom Orders? Contact Hazel here.